Preheat oven to 350 degrees F. Coat a cooling rack with olive oil and place on a baking sheet; set aside. Place zucchini onto prepared baking sheet. Drizzle with olive oil and sprinkle with Parmesan mixture. Place into oven and bake until tender, about 15 minutes. Then broil for 3-4 minutes, or until crisp and golden brown. Preheat the oven to 350 degrees F. and place the almonds on a baking sheet. Roast just until the almonds begin to brown, about 8 to 10 minutes. 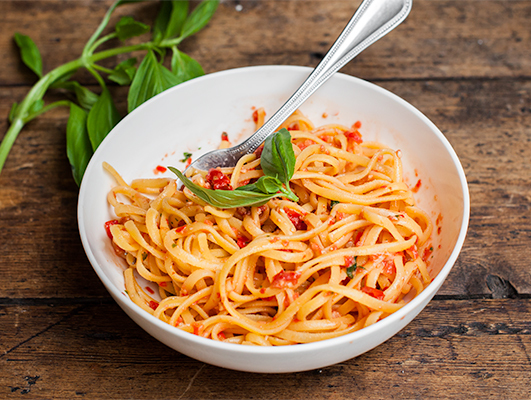 Place the almonds in a food processor along with the garlic, canned tomatoes, sun-dried tomatoes, red pepper flakes, basil, and olive oil. Pulse until the mixture is finely ground but not pureed. Season with a pinch of salt and pepper. Cook the pasta in boiling, salted water until it is “al dente.” Drain, and toss the pasta with the sauce and grated cheese. Serve immediately, garnishing with basil leaves. Enjoy! Cook pasta until Al Dente. While the pasta is cooking, saute chopped garlic in Arbosana EVOO until golden brown. Remove the pan from heat and add 3/4 of the parsley. Drain the pasta and combine with the sauce in a separate bowl and toss until all the pasta is coated. Garnish with remaining parsley and enjoy! Salt and pepper to taste. For a little extra flavor, toss pasta with halved cherry tomatoes and freshly grated Parmesan cheese! Cut the eggplants lengthwise into slices about 1/2” thick. Sprinkle with coarse salt and olive oil, let drain in a strainer for at least 30 minutes. Mince the garlic. In a nonstick frying pan, saute the pancetta till crisp (like bacon) remove and drain the fat off leaving a small amount in the pan. Add the chopped tomatoes, pinch of sugar, salt, pepper, bay leaves, and basil leaves over a medium flame. Set aside. Brown the drained eggplant over high heat for 2 minutes on each side. Preheat oven to 350°. Place the eggplant slices in a large baking dish. Add slices of mozzarella, then the grilled pieces of pancetta and bits of goat cheese. Top with tomato sauce. 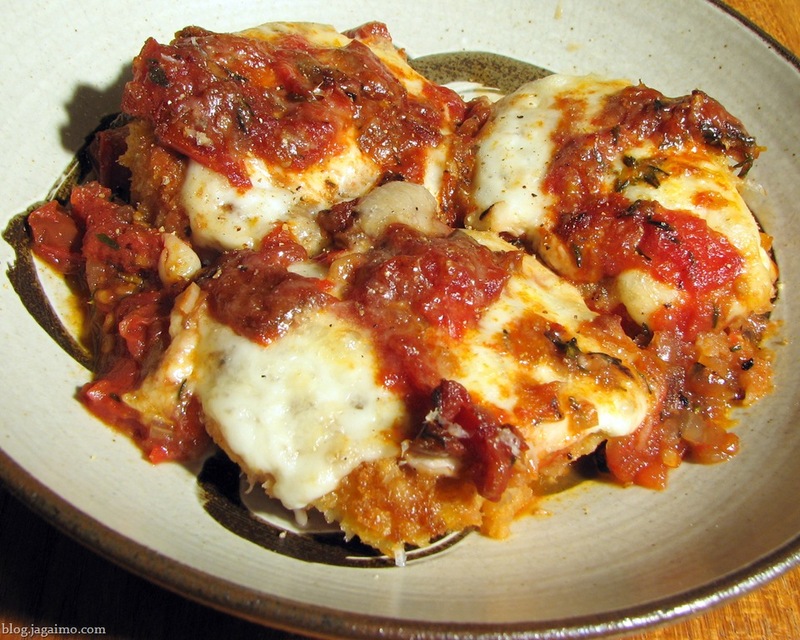 Sprinkle Parmesan on top and bake for 20 minutes. Serve warm with fresh basil. 1. In a large skillet, heat the olive oil. In a small bowl, toss the capers with the cornstarch and shake off the excess cornstarch. Add the coated capers to the oil and fry over high heat, tilting and gently shaking the pan until the capers are crispy and golden, about 3 minutes. Drain the capers, reserving 2 tablespoons of the oil in the skillet. Spread the capers on a paper towel–lined plate. 2. Add the anchovies and garlic to the skillet and cook over high heat, stirring until the garlic is golden and the anchovies dissolve, about 3 minutes. 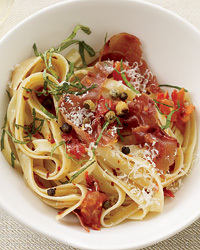 Add the prosciutto, separating the ribbons, and cook until lightly browned, about 1 minute. Add the tomatoes and crushed red pepper and cook just until the tomatoes begin to break down, about 3 minutes. Stir in the basil. 3. Meanwhile, in a large pot of boiling salted water, cook the pasta until al dente. Drain and return the pasta to the pot and pour the sauce on top. Toss over high heat just until the sauce is thickened, about 2 minutes. Serve the pasta in bowls, garnished with the crispy capers. Top with cheese!